Diarmuid O'Connor made Mickey Conroy especially happy after winning the Young Footballer of the Year award. WHILE ALL HIS team-mates were probably trilled to see Diarmuid O’Connor pick up the Young Footballer of the Year prize at last night GAA/GPA Allstar Awards, few would have been as happy as Mickey Conroy. The Davitts man, who failed to break into the Mayo starting XV this year and was ruled out altogether with a shoulder injury in August, put €100 on O’Connor to win YFOTY back in May, well before the Westerners opened their 2015 championship campaign. And it paid off — at odds of 33/1 — when the forward saw off the challenge of Monaghan’s Ryan Wylie and Donegal star Ryan McHugh to win the award last night. 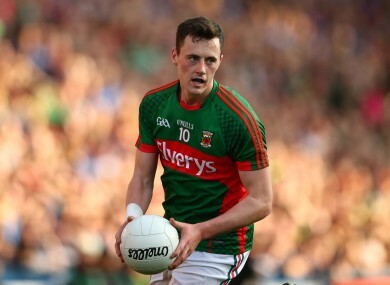 Email “Diarmuid O'Connor won a Mayo team-mate over €3,000 by winning Young Footballer of the Year”. Feedback on “Diarmuid O'Connor won a Mayo team-mate over €3,000 by winning Young Footballer of the Year”.